Megaways is a video slot mechanic by Big Time Gaming (BTG) that is slowly taking over the realm of online slots because of its popularity among punters who are looking for [a lot] more ways to win than 20 or 40 pay-lines. 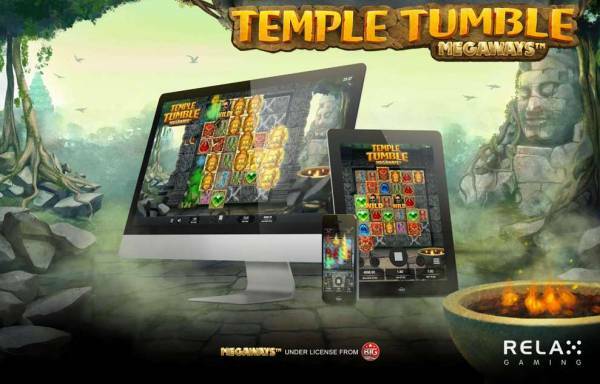 And now there’s another hot new video slot with the Megaways feature: Temple Tumble from Relax Gaming. It’s their biggest launch to date and here’s what you should know. Temple Tumble, not to confuse with Big Time Gaming’s in-house game Temple Quest, is a 6×6 video slot. As to be expected with all “mega” slots, it’s highly volatile and features no less than 46,656 ways to win! What’s more, Relax Gaming decided to step this flagship game up a notch and added the beloved cascading mechanic (think Gonzo’s Quest) which means all wins get destroyed as new symbols drop down for new chances to win. Temple Tumble Megaways can be played for 0.20-100.00 credits per spin, while enjoying the Lara Croft/Book of Dead vibe. There are 9 regular-paying symbols plus a wild card, which appears on reels 2-6 and substitutes for all symbols. The most interesting part starts when you trigger Free Spins, because there you get to choose between multipliers, extra spins or a combination of the two as their reward for cracking open more stone tiles! The Temple Tumble slot is live at featured Relax Gaming casinos right now, so be sure to give it a try in a demo or for real money among other Relax’s established favourites like Erik the Red and The Great Pigsby. Some other Megaways licensees to date include Blueprint, Scientific Games, Storm, Kalamba, Fantasma, iSoftbet, and Red Tiger, so more Megaways-branded video slots are surely in the pipeline. One of the earlier ones from Blueprint Gaming, called Slots O’ Gold, we even reviewed with all of its bonus features in this news report. In fact, Megaways type slots have become so popular that even A-class sportsbooks like Ladbrokes now have a dedicated Megaways tab, featuring mega hits like Bonanza and branded ones like Who Wants to be a Millionaire?. To learn more about Ladbrokes, refer to our full casino review with our rating; and if you decide to give it a go then be sure to leave your own comment in the feedback section below as well.